Reform cuisine | JP Natural Produkt s.r.o. Simply mix the powder with water (250 g of powder and 0,5 l of water) and put into the oven heated to 160-180°C. This traditional method that used to be called “kalkyš” in the past is suitable especially when you wish to prepare several portions of this natural and naturally sweet delicacy that we may call “THE GIFT OF NATURE”. Check it out - try it! ¨ serve it as it is prepared or season it with genuine natural products, e.g. 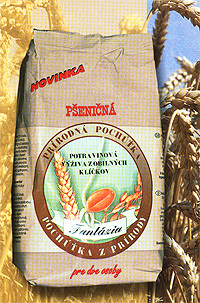 minced nuts, peanuts, pumpkin seeds, chestnuts poppy seeds, honey, raisins, stewed fruits, etc. Do not forget: more ideas – more flavours!